Chatting is all the rage these days. With the aid of technology, of course -- who does that in person anymore? Which is why Microsoft has launched a new team-chat app, Teams, to directly take on chat-app Slack, a tool that has been implemented in countless industries to ease workplace communications. Slack isn't taking the news lying down, though -- the company has issued an open letter to Microsoft, offering the tech giant some advice, while throwing in a few digs along the way. In IT Blogwatch, we discuss the whole thing on our chat apps. Microsoft unveiled a corporate team-chat service that works with its cloud-based Office and Skype products, aiming to take on Slack and...HipChat in a growing market. Microsoft's product allows teams to add what it's calling Tabs, to quickly link to frequently used files and applications. These tabs can relate to Microsoft products like...OneNote...or to outside products -- the company said it's adding support for Zendesk and Asana soon. Teams can also bring in notifications from services like Twitter and GitHub...it also supports the usage of bots -- programs that chat with users to automate tasks. Microsoft's...product is closer to a set of threaded conversations than a wide-open chatroom -- a key difference between it and Slack...that means...users can start a conversation about a particular topic, and keep everything about that topic organized in one place. 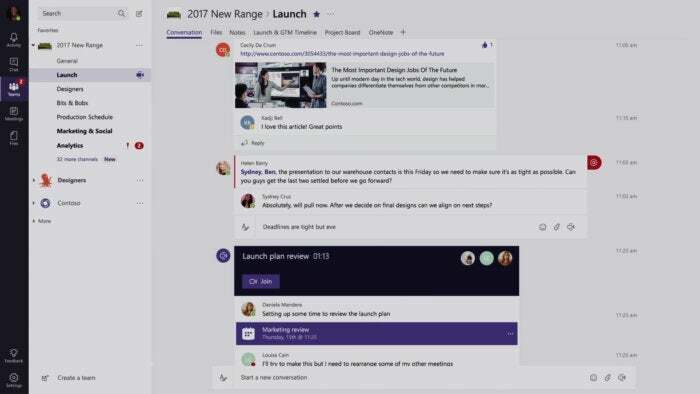 An Activity tab gives users a bird's eye view of all the different conversations...going on inside a team...so people can get a quick view of what they need to know...Microsoft is also bringing the power of its Office document collaboration to...the new service. Whenever a user uploads a document...everyone in that channel will be able to view the document live using Office Online...Users will also be able to hop on live voice and video calls with other people on a team. This feature is powered by Microsoft's Skype infrastructure. Microsoft hopes to set Teams apart with features that bring Office 365 tools into the service. You can autosave attachments to folders...pin frequently used files to your dashboard, integrate your planner or task manager and use third-party plug-ins like Zendesk. A preview of Teams is available immediately in 181 countries in 18 languages. Microsoft plans to release the full version...during the first three months of next year. Wow. Big news! Congratulations on today’s announcements. We’re genuinely excited to have some competition...even though — being honest here — it’s a little scary, we know it will bring a better future forward faster. First, and most importantly, it’s not the features that matter...Communication is hard, yet it is the most fundamental thing we do as human beings...Second, an open platform is essential...We are...committed to making our customers’ experience of their existing tools...better, no matter who makes them. We know...playing nice with others isn’t exactly your MO, but if you can’t offer people an open platform that brings everything together into one place and makes their lives dramatically simpler, it’s just not going to work...One final point: Slack is here to stay. We are where work happens for millions of people around the world...And we’re just getting started. Don't you wish Microsoft would just fix...MS Word and Excel rather than embarking on some new techno wizardry?